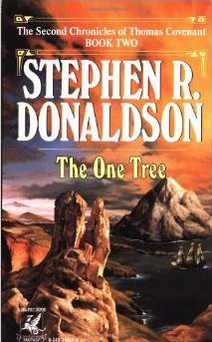 “The Chronicles of Thomas Covenant”, by Stephen Donaldson, is a series of adventures of Thomas Covenant in the world called “The Land”. This series is quite popular and the writer is compared with J R R Tolkien at his best. The writer grew up in India, where his father worked with lepers. This can be seen in the way he portrays Thomas Covennant as a leper and the treatment he recieves from the society. There are plenty of Indian sounding names present in the story, however, they are not always used correctly. The first book of the series is called “Lord Foul’s Bane”. Thomas Covenant’s world turns upside down when he discovers that he has leprosy. From a successful author, a happy husband and a proud father, he becomes an outcast divorcee in a very short period of time. He receives the initial treatment at a leprosarium and is allowed to go back to his home. However, his neighbours and villagers shun him completely. On one lonely and bitter visit to the town, he meets a beggar who asks him strange questions about morality. An accident follows, and Thomas Covenant is transported to a different world, called The Land. His adventure starts as the evil Lord Foul charges him with the task of delivering a prophecy of doom and destruction to the Lords of the Land. Covenant finds himself on a mountain and a young girl named Lena finds him and takes him to her home. In the Land, he is considered a reincarnation of a legendary hero, Berek Halfhand, and his white gold wedding ring is considered a talisman of great power. However, to Covenant, the Land is a delusion, a trick of his mind and he denies to believe in it, becomes the Unbeliever. The Land is a magically healthy and beautiful place and Covenant realises that his leprosy is somehow cured. This sudden healing is more than he can handle, and losing control of himself, he rapes Lena. However, since his message must be given to the Lords, Lena’s mother Atiaran agrees to guide him to Revelstone, home of the Lords. On the road, Covenant learns the history of the land and the story of the ancient war between the Old Lords and Foul, which ended in millennia of desecration for the Land. After Atiaran, a giant called Saltheart Foamfollower, helps Covenant and he finally reaches Revelstone. There he is accepted as an ur-Lord. The lords are dismayed on hearing Foul’s message, that an evil cavewight holds the powerful Staff of Law. They no longer have even the powers of the Old Lords whom Foul overcame; of the Seven Wards of lore, they have only the first. But the Staff, held in the caverns under Mount Thunder, must be found and won. Covenant accompanies the Lords and their guards, called Bloodguards, on this quest. Together they go to the Plains of Ra, where the Ramen serve the Ranyhen, the great free horses. The Ranyhyn bow to the power of Covenant’s ring, and promise to serve him in the hour of his need. The Lords ride to Mount Thunder. After many encounters with evil creatures and dark magic, High Lord Prothall wrestles the Staff from Drool, the Cavewight. They escape when Covenant manages to use the power of his ring – without understanding how. As the Lords flee, Covenant begins to fade. He wakes in a hospital bed; only a few hours have elapsed since his accident. His leprosy has come back, supporting his belief that the Land is a delusion. He is discharged from the hospital and returns home. This is where the first book ends, but its far far away from the end….Enjoy……….